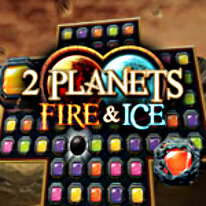 Experience 2 Planets Fire and Ice: quite possibly the fastest match-3 game ever! Experience 2 Planets Ice and Fire: quite possibly the fastest match-3 game ever! Over 140 levels with different objectives virtually guarantee endless fun! You have the choice between two different game modes, each with fantastic HD graphics: solve the more relaxed levels presented to you on the ice world or accept the challenge of the timed mode on the Fire Planet. Complete the exciting levels by eliminating a specific color, move special stones to the bottom of the game board, and position game pieces to form as many explosions as you can!